I was born in an Amish type community in central Illinois. I left the farm to attend the University of California in the turbulent sixties. My childhood experiences in a small religious community — some wonderful and some difficult — shaped the qualities people know me for: curiosity, openness, compassion, an exploratory nature and a deep commitment to creating community. After taking a Bachelor's degree in Psychology from the University of California, I found myself in a difficult position. The war was raging in Vietnam, and I was #53 in the draft lottery — a sure bet on being drafted. Given my philosophically non-violent upbringing, I chose to leave the States instead of joining the war. After traveling extensively throughout Europe, eventually my savings ran out and I took a job running a small farm in a tiny village on the Island of Cyprus, off the coasts of Greece and Turkey. Upon returning to the States, I was ordained as a Minister in the United Methodist Church in 1978. I attended Seminary where I received a Master of Divinity degree, and then took a position as a Hospital Chaplain. During the 24 years of my professional career as a minister, I have acted as Hospital Chaplain in five hospitals. As a Chaplain Supervisor, I taught seminary students the art of listening and being with people through difficult times. I would tell my students, "If you are going to be a good Chaplain, then you must learn ‘The Way of Father Mulcahy' (M*A*S*H). You must find a way to touch the heart, and talk to a Buddhist as easily as a Baptist". This was my own style of ministry. I was unorthodox, but genuinely compassionate, just like Father Mulcahy. And when a Presbyterian wanted to marry a Jew, I was happy to be the one to call. Much to the consternation of my Bishop, I was usually 'stirring up the pot' in a Church that prided itself on keeping a lid on the status quo. It wasn't long before I earned the nickname 'IrReverend Ken' — a moniker with which I was quite pleased, and wore proudly. Subsequently, I was a college professor in Denver, Colorado, teaching psychology and comparative religions for 16 years. I then became a Certified Marriage and Family Therapist, a role in which I was proud to distinguish myself clinically. In 1989, I was called to blend psychology with theology in my work, and I received my Doctoral Degree in Pastoral Counseling from The Graduate Theological Foundation at Notre Dame University. For 15 years, I was the Founder and Director of the Hope Care & Counseling Center in Denver, Colorado. In this position, I developed and supervised over 20 satellite pastoral counseling centers throughout the Denver Metro area. In 2000, I semi-retired and began a new career as a writer. My first two projects focused in research and development of travel guides to Europe for people with limited mobility. During this time, I wrote a popular book with the well-known PBS travel guru, Rick Steves, on accessible travel called Easy Access Europe that has gone to press twice with Avalon Travel Publishing. This brought with it further expansion and creativity. I started spending more time working and writing at my home in San Carlos, Mexico, overlooking the Sea of Cortez. Out of this work, I developed a training program within hospice helping professionals, patients and families deal creatively and consciously with the emotional and spiritual aspects of the dying process. I served the Denver and Tucson community for over 18 years as a Hospice Chaplain. Upon my return from living in France, I was the Director of Social Services and also a clinical supervisor at Soulistic Hospice, working out of Tubac, AZ and Tucson, AZ. I oversaw the social services team, comprised of chaplains, social workers, bereavement counselors and volunteers. ​The creativity of semi-retirement spawned a new career working with end-of-life issues and Elder issues. This fits perfectly with my community awareness work around aging. I now write, speak, and coach on the topic of consciously creating vibrant 'Elderhood'. I served for five years on the Board of Directors of The ManKind Project. I was proud to be called to be the Center Director of the Colorado ManKind Project from 2005 to 2007. I conducted men's leadership trainings and experiential personal growth seminars in this impactful organization. MKP seeks to 'change the world one man at a time' by helping men connect head and heart while leading lives of integrity, authenticity and service. I also served as Vice-Chair of the International Council of Elders in The ManKind Project. And then came the call from Arizona and it was time to move to Tucson in late 2007 to care for my aging folks. So, I began afresh here in the gorgeous Sonoran desert with my sweetheart and sweet wife Claire O'Connor. 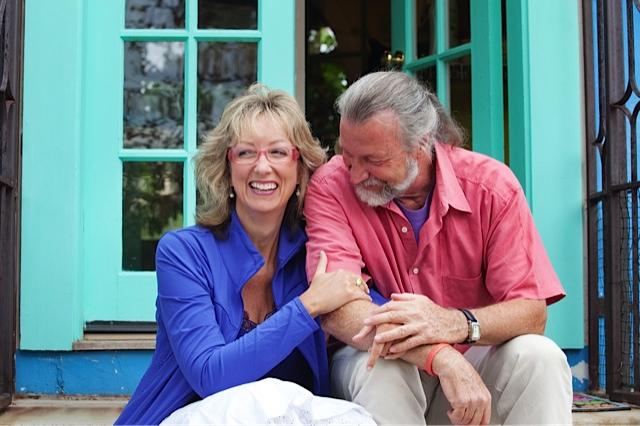 Together, we've completed 5 years of advanced training as a Certified Conscious Relationship Coaches with Gay Hendricks and Kathlyn Hendricks of the Hendricks Institute for Conscious Living & Loving. Everyday, we continue to use the skills we learned to create an intentional and playful life together. In 2012, after selling our home in Tucson, my wife and I relocated for a year-plus to the south of France, to Roquebrun, an exquisite little village on the banks of the River Orb in the heart of the wild Languedoc region. It was a Bucket List adventure that gave us an abundance of blessings. ​My adventurer son, Nikos, is following his dreams as a Wilderness EMT, back-country medicine instructor, and ski patroller in Montana and Colorado; and I've helped raise four wonderful stepchildren who are now all grown. Being a father has taught me more than anything else I've been, and I beam with pride at these fine people who've been my greatest guides and inspiration. Now based back in southern Arizona, in Tucson's beautiful Sonoran Desert, I'm available worldwide as I continue offering mentoring, wedding officiant, funeral celebrant and facilitation services. Contact me about Mentoring for Vibrant Elderhood, international men's retreats, soulful hiking for all, or the possibility of officiating your wedding or other rite of passage.